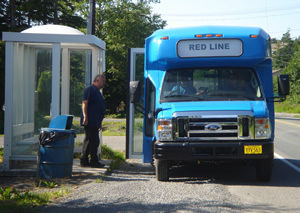 The Rural Transportation Assistance Program (RTAP) provides a source of funding to assist in the design and implementation of training and technical assistance projects and other support services tailored to meet the specific needs of transit operators in nonurbanized areas. The federal program provides an annual allocation to each State to develop and implement training and technical assistance programs in conjunction with the State’s administration of the Section 5311 formula assistance program. The ARRA, signed into law by President Barack Obama on February 17, 2009, included $9,083,900 in capital public transit funds for rural Alaska. These funds were made available to eligible public transit systems through a combination of formula and ARRA scoring. SAFETEA-LU created a new Tribal Transit Program, and funds it as a takedown under the Section 5311 program. Under the Tribal Transit Program, Federally-recognized Indian tribes are eligible direct recipients. Based upon an annual national competitive selection process, FTA awards Tribal Transit grants directly to eligible Indian tribes.